Sri Khodiyar Mataji Jayanti is observed on the eighth day (Ashtami) during the waxing phase of moon (Shukla Paksha) in Magh Month. 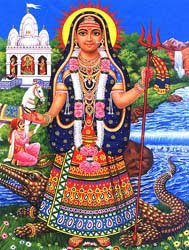 Goddess Khodiyar Mata Jayanti 2019 date is February 13. She is worshipped mainly in western parts of India, especially in Gujarat. It is popularly believed that this Hindu Goddess appeared on the Magh Shukla Ashtami day. The popular belief is that Mamaniya Gadhvi, who was a scholar and friend of king, was humiliated by the queen and soldiers as he did not have any children. Mamaniya prayed to Lord Shiva for a child. One day Lord Shiva appeared before him and took him to the world of Nagas (Snakes). The Nagas agreed to help him. They asked him to prepare eight cradles and wait. Mamaniya did as he was told. Soon a snake appeared on each of the cradle. They took the form of babies. Thus the man had seven girl child and one male child. Goddess Khodiyar Mata is one of the children. She is believed to have performed numerous miracles to help her devotees. She is also the patron deity of some Hindu communities in western part of India. The popular shrines dedicated to Goddess Khodiyar are located at Rajapra, Matel, Galdhara and Aiyavej.